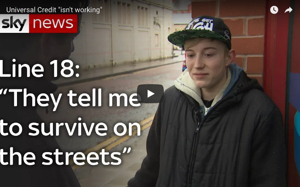 Some people have no idea… Homelessness as described by a Tory. This week I had an interesting conversation. Whilst in manchester on Wednesday I had noticed the massively increasing number of homeless people on the streets. I had a good chat with some of them and bought them something to eat and drink. They need to keep warm. It’s getting cold out there. I happened to bring this up in conversation and this is how my Tory “friend” replied… He said “I don’t know of any homeless person that doesn’t want to be homeless. They like living like that and it’s their choice to live like that”. I responded and stated the obvious. That it’s not a lifestyle choice. They have no choice. They’ve ran out of options and can’t afford to stay anywhere else. They might have had nice homes, jobs, families. Then something happened. They could have lost their job, their relationship might have broken down or they could have left the army with ptsd or they could have been sanctioned and made homeless because of the bedroom tax. Left with no viable option they turn to the streets, begging for enough money to eat or if they are lucky enough to find a bed for the night. The universal credit scheme will not allow anyone to claim who hasn’t got an address. This is so wrong.They want nothing more to have somewhere warm to live and have a job to go to. We need to change people’s perception of homelessness and people claiming benefits. We need to stand with them and demand that they are treated fairly and with compassion. And as for my Tory friend… Well I educated him and I hope he has a different view now but I won’t hold my breath. 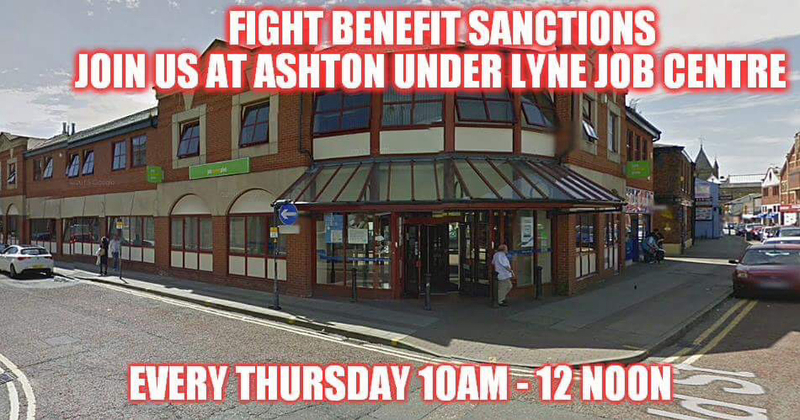 Please join us on our weekly demonstrations outside Ashton under lyne Jobcentre on Thursdays at 1pm until 3pm. And thank you to our friend who travelled a long way to join us. Your support will never be forgotten. Success story of the week. A person who had recieved no money for months due to unlawful sanctioning has at last had a payment so has gone out today and bought some food. That makes me feel good. This is why we help people. Stand with us and be sanctioned. Jobcentre bullying at its worst. Speak against the government and be labelled a terrorist. So true and I hope people really hear this. It really is. And the Tory who said this has said that there is no homelessness in the uk and I should just accept that….. I would like to know what planet he lives on because it’s different than the planet we live on. You’ve seen nothing yet. The UK always follows its master the USA, and in many parts of the US it is now illegal to give food to the destitute. Sometime in perhaps a decade you might look back and think, IDS was such a softie, if only we could have him back in charge of welfare. Yes I’ve seen that and am very aware of the US but I will never ever say that ids is a softie. Yeah, my “softie” comment was a bit tongue in cheek, but it’s worth remembering that what we consider to be cruel poverty today was unimagined luxury a century ago, and could be once again in the future.